Guantanamo Bay Naval Base (also called GTMO and pronounced gitmo by the US Military personnel stationed there) is located on 45 square miles (120 km2) of land and water at Guantánamo Bay, Cuba, which the United States leased for use as a coaling and naval station in the Cuban–American Treaty of 1903 (for $2,000 until 1934, for $4,085 since 1938 until now). 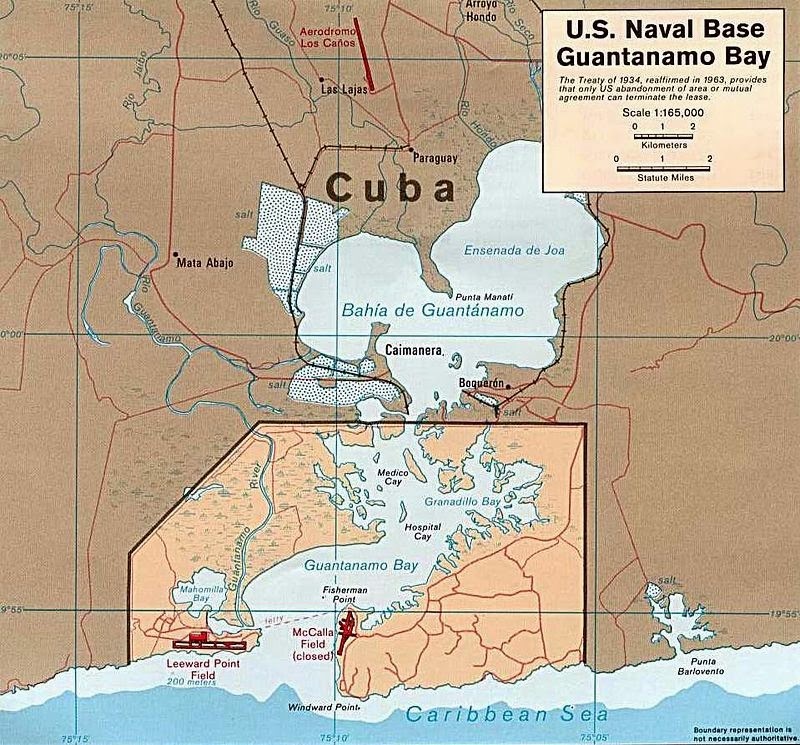 The base is on the shore of Guantánamo Bay at the southeastern end of Cuba. It is the oldest overseas U.S. Naval Base, and the only U.S. military installation in a country with whom the United States has no diplomatic relations. Since 1959 the Cuban government has consistently protested against the US presence on Cuban soil and called it illegal under modern international law, since the military base was imposed on Cuba by force. At the United Nations Human Rights Council in 2013, Cuba's Foreign Minister demanded the US return the base and the "usurped territory" occupied since the US invasion of Cuba at the turn of the 20th century. Since 2002, the naval base has contained a military prison, the Guantanamo Bay detention camp, for alleged unlawful combatants captured in Afghanistan, Iraq, and other places. Cases of torture of prisoners, and their denial of protection under the Geneva Conventions, has been condemned by some internationally.